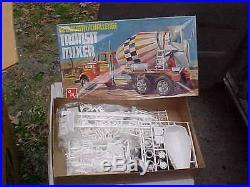 AMT, 1/25 SCALE,,,, ORIGINAL,,,, K/W CHALLENGE TRANSIT MIXER,,,, NEW IN ITS BOX, UN-BUILT, STILL SEALED IN ITS PLASTIC BAGS ON THE INSIDE OF THE BOX,,,.. MINT SEALED--NEVER OPENED, STILL IN ITS CELLOPHANE, OR BOX TAPED SHUT, NEVER OPENED. NEW IN ITS BOX, UN-BUILT, STILL SEALED IN ITS PLASTIC BAG--HAS BEEN OPENED, HOWEVER, THE PLASTIC BAG ON THE INSIDE HAS NEVER BEEN OPENED. NEW IN ITS BOX, UN-BUILT--THE KIT HAS BEEN OPENED, PARTS MAY OR MAY NOT REMAIN ON THEIR ORIGINAL SPRUES, HOWEVER, STILL NEW UN-BUILT. WHEN YOU ARE IN THE YORK, PENNSYLVANIA AREA, STOP IN AND SEE YORK'S LARGEST LIONEL TRAIN DEALER, AND LOOK AT OVER 1000 MODELS ON DISPLAY FOR SALE. The item "AMT, KW CHALLENGE TRANSIT MIXER" is in sale since Thursday, December 10, 2015. This item is in the category "Toys & Hobbies\Models & Kits\Automotive\Truck". The seller is "deadplasti2002" and is located in Mount Wolf, Pennsylvania. This item can be shipped to North, South, or Latin America, to all countries in Europe, to Japan, to Australia.